Looks like Little Killer Sudoku got its name from Killer Sudoku puzzle. In Killer Sudoku Puzzles sum of numbers in marked cages is given and number does not repeat in these marked cages. However in Little Killer Sudoku sum of the diagonals is marked at the outside grid. 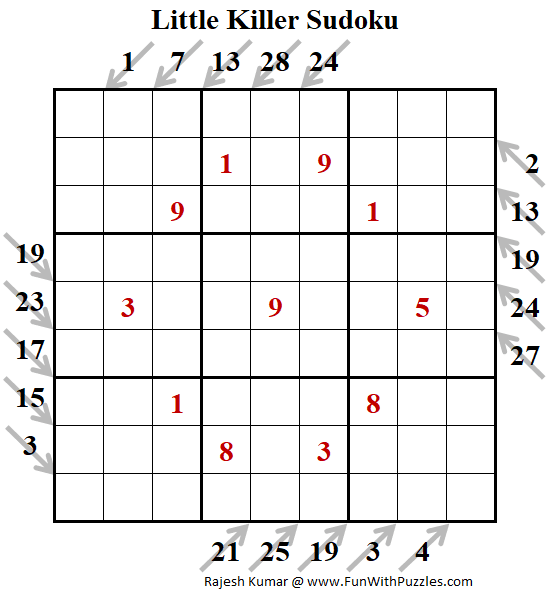 In Little Killer Sudoku, numbers can repeat on diagonals. All in all both of these Sudoku types are very interesting puzzle types. Now a days Little Killer will be part of any World Sudoku Championships. Here is my next Little Killer Sudoku, which I am publishing as part of Fun With Sudoku Series as 270th Sudoku Puzzle in this Series. Standard Sudoku Rules apply. Additionally numbers with arrows indicate sum of the numbers in each direction. This Little Killer Sudoku, I am publishing as 270th Sudoku puzzle in Fun With Sudoku Series. Here are the next are previous Sudoku puzzles published in this series.